It is something of a delicate situation for the Government. Facing into a bruising general election campaign with Sinn Féin doing well in opinion polls, the temptation to milk political capital out of the situation must be strong. On the other hand, as Sinn Féin frequently reminds it, the Government is a co-guarantor of the Belfast Agreement. To allow itself to be portrayed as a player which jeopardised the continuance of the peace process would be damaging for Government TDs in the Border region and beyond. This entry was posted in Arts & Culture, Northern Ireland, Politics and tagged Seamus Heaney, Troubles on August 24, 2015 by admin. The post reads like a last ditch attempt to breath life into a piece that was DOA. For all the calculated timing to coincide with St. Patrick’s Day, it doesn’t appear this story will have much impact. I’ve just finished reading Patrick Radden Keefe’s 15,000-word piece in The New Yorker about Gerry Adams and the Jean McConville murder. “Where the Bodies Are Buried” could be a good introductory piece for those who are unfamiliar with Adams and the Troubles. But if you’ve been following the story for decades, as I have, there’s nothing new here. It’s a big rehash of well-known events from 1970s Belfast to contemporary reporting of Adams’ Twitter habits and controversial comments at a Friends of Sinn Féin fundraiser in New York City last fall. 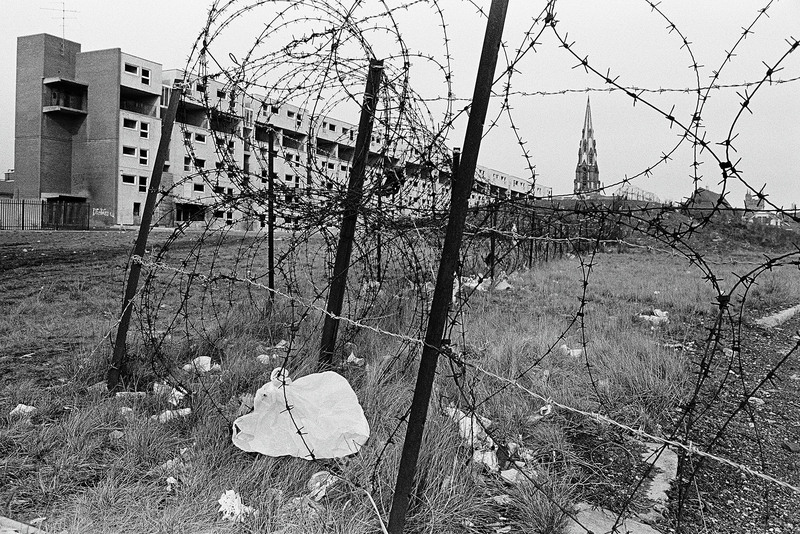 Chris Steele-Perkins photographed Divis Flats, a republican stronghold in Belfast, during the late 1970s. More images at The New Yorker. Keefe’s story is generating a few headlines about Adams’ allegedly ordering McConville’s 1972 disappearance and murder, as well as a 1974 bombing campaign in London. The charges are primarily attributed to Dolours Price, a former IRA member who died in 2013. It’s all been previously reported and denied by Adams, who did not comment for this article. The New Yorker‘s website also features a photo essay, “Life in Divis Flats,” by Magnum photographer Chris Steele-Perkins. It’s worth clicking through. This entry was posted in History, Northern Ireland, Politics and tagged Gerry Adams, Troubles on March 16, 2015 by admin. The Irish and British governments and the five Northern Executive parties reached a wide-ranging agreement on budget and welfare reform, as well as the legacy of the Troubles and other contentious issues such as flags and Orange parades. “On one of the darkest days in the bleak midwinter we have forged a broad agreement that will undoubtedly give rise to brighter days in Belfast and throughout Northern Ireland and indeed throughout the island of Ireland,” said Minister for Foreign Affairs Charlie Flanagan, as reported in The Irish Times. The agreement, which still requires final ratification, also could clear the way for Northern Ireland to reduce its corporate tax rate, now 21 percent, to the same as Ireland’s, 12.5 percent, The New York Times said. That could happen by 2017, according to the The Wall Street Journal. This entry was posted in Northern Ireland and tagged corporate tax, parades, Troubles on December 24, 2014 by admin. The U.S. Supreme Court is being asked to settle a legal dispute over the release of the tape recorded interviews of people involved in violence during The Troubles in Northern Ireland. The case involves the governments of the United States and United Kingdom, as well as Boston University, and the perpetrators and surviving family of a 1972 IRA killing. Here’s a quick summary of the details from the Boston Globe. Here’s a video report from the PBS NewsHour. There is some irony here. The case has been working its way through the courts at the same time Ireland’s Bureau of Military History has made available online more than 1,700 witness statements from the revolutionary period 1913-1921, as we detailed two posts below. Were there any legal attempts to have those statements released to prosecute events that had happened decades earlier? Is there a secondary issue of considering these matters as crimes or as war-related? I certainly understand the surviving family members desire for justice. And as a journalist I have frequently argued for the release of any material that sheds light on public events. But I also understand the BU researchers’ desire to keep their word to the people who came forward to give statements, just as I would want to protect a source. I also have some sympathy for the witnesses who shared their stories in the belief their remarks were being kept secret until after their deaths. It’s an interesting and thorny case. This entry was posted in Northern Ireland and tagged IRA, Troubles on September 1, 2012 by admin.